"When I turned 55—I'm now 70—my wife, Alice, said to me, 'What do you want to do for the rest of your life, more of the same?'" recalled Jung, a UCLA distinguished professor of chemistry and biochemistry. "I said that didn't sound like such a bad idea until you put it that way." "I really thought seriously," said Jung, who at the time was an organic chemist who designed new synthetic molecules and conducted pure, rather than applied, research. "If you're going to change anything, you better do it soon. I decided to do what I had always wanted to do, but never had the guts to try: I would change my research group from synthetic chemistry to drug discovery to see if we could create a drug for some human disease. That's a ridiculously grand goal because you can work 40 years in the pharmaceutical industry, know exactly what you're doing and still never produce a drug. But I figured if you're going to have a goal for the rest of your life, it might as well be a big one. And, even if I failed miserably, people would just say, Mike Jung must have taken early retirement." One day later that year in 2003, a faculty colleague, Charles Sawyers, a well-known biologist, came to Jung's office and said, "Let's stop prostate cancer." "I didn't know a thing about prostate cancer," Jung acknowledged, "but I said, 'Great idea,' and that's how we got started." In his laboratory, Jung designs molecules that do not exist in nature. Sawyers, then a professor of medicine and molecular pharmacology at UCLA (currently a Howard Hughes Medical Institute investigator and chair of the human oncology and pathogenesis program at Memorial Sloan-Kettering Cancer Center in New York), and his research group tested many molecules that Jung's research group had made, two of which looked extremely promising. UCLA, which is ranked as a national leader in converting research discoveries into medications and other products and services that benefit the general public, licensed apalutamide and enzalutamide to the private sector for development into medications. The phase 3 clinical trial for Erleada was conducted at 332 locations in 26 countries, with 1,207 patients who had a rapidly rising prostate specific antigen and whose CT scans showed no evidence that the cancer had spread beyond the prostate—806 of whom were given 240 milligrams daily of Erleada and 401 of whom were given a placebo. The data supporting Erleada's effectiveness and safety were so strong that the FDA decided to end the trial a couple of years ahead of schedule (after slightly more than three years). During the trial, the patients and their doctors did not know who was receiving Erleada and who was receiving the placebo; when the trial was cut short, the men taking the placebo were given the option of taking the pharmaceutical. The FDA had also cut the original Xtandi trial short because of that drug's effectiveness. The phase three trial for Erleada showed that, after 16 months, on average, men taking the placebo had their cancer spread from the prostate to other areas—such as the bones, lymph nodes or brain—while for those men taking Erleada, the time before the prostate cancer began to spread was extended to more than 40 months, on average. This result was observed in men in all age groups. "The phase three clinical trial found that Erleada gives men an extra two years of healthy life before their cancer spreads," said Jung, who is also a professor of medical and molecular pharmacology and member of UCLA's Jonsson Comprehensive Cancer Center. "To give someone an extra two years of healthy life is fabulous." "I thought if we could stop that—or if we could interrupt the binding of testosterone to its receptor—we could slow down the growth of the cancer," Jung said. The standard treatment for aggressive prostate cancer is chemical castration or "androgen ablation," which greatly decreases the production of testosterone and deprives the body of androgen, slowing the progress of the cancer significantly. 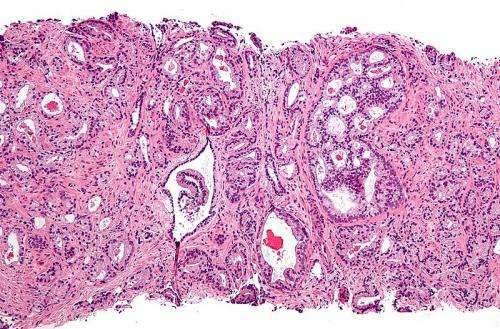 But for a very high percentage of those patients who relapse and then develop castration-resistant prostate cancer, there was no known treatment. Samedy Ouk, a former postdoctoral scholar in Jung's research group, made the compound that eventually became Erleada. Jung's research was funded by the National Institutes of Health's National Cancer Institute and the Prostate Cancer Foundation.